I reconnected with my love of Scotland yesterday as I was grazing the website of Jules Watson (a must read BTW). Have you ever felt connected to a land that you have never been to, in a way that is hard to explain, even to yourself? That is how I feel about Scotland. Also on Jules' site is an old Scottish song sang (her favorite) by her husband and you have got to listen to it ...it's one of the most beautiful songs I have ever heard and he sounds fantastic. I must have listen to it a dozen times. It's under her About Me section on her website. Enjoy!! I know exactly how you feel, I have felt that way about Scotland since I was about 18 years old. Can't explain it! 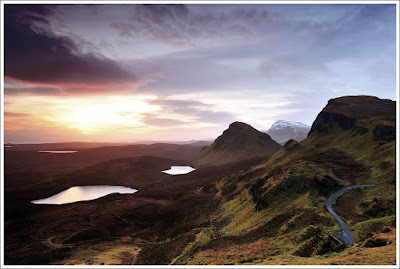 Gorgeous...I would love to visit Scotland! Some of my ancestors are from the Isle of Skye and I'm so happy I got to visit the island before they put in the bridge! (So much more romantic to have to take a ferry to get there.) It's a beautiful spot. Thanks for the photo! I love Jules Watson's books! I had no idea that she had a blog, thanks for pointing me to it! Scotland is wonderful. We went to the southern Hebrides a couple of years ago and just fell in love. We were on the tiny island of Iona when the sun broke through the clouds and washed the whole place in the most incredible light, it was the most beautiful spot I have ever been. Listened to the song...loved it! Some of my ancestors are from Skye; many more from other spots in the Highlands, so I've always felt fiercely connected to Scotland...until I visited. Traveling through the Highlands, stepping foot on Skye, spending a week in a cottage at the foot of Dunvegan Castle...the reality increased that feeling of fierce connection a thousandfold. Thanks for pointing me toward Jules Watson! That is such a gorgeous picture. I would love to travel to Scotland. We go to many Celtic concerts, and that song is lovely. I found her comment about Celtic souls interesting. I do have Irish and Scots heritage, and have always been pulled there. Someday soon, I hope my DH and I will make it.